Oktoberfest Lager is available August – November in 12 oz cans and on draft in 1/6 bbls and 1/2 bbls. 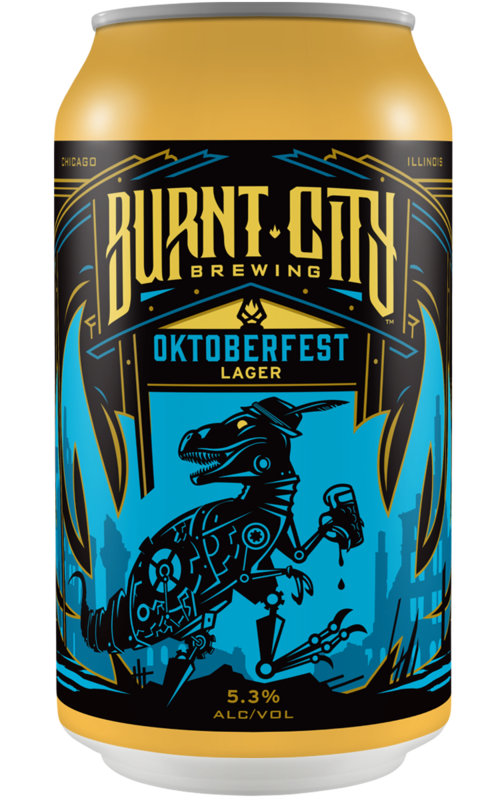 Burnt City’s Oktoberfest Märzen celebrates the wonderful German tradition as respectfully as possible. Fancy German malt and hops were used in this flavorful, quaffable amber lager. Malt notes are prominent, but the beer finishes dry. Hop character is subtle, adding a gentle floral aroma. Obviously Oktoberfest is best enjoyed at the end of September but if we’re being honest Oktoberfest improve almost any social experience. It’s great at end-of-summer barbecues, Friday night karaoke and Saturday tailgating. But we know Oktoberfest is most appropriately poured into a liter stein, hoisted high in the air and chugged in unison with all fellow bar goers. Prost!